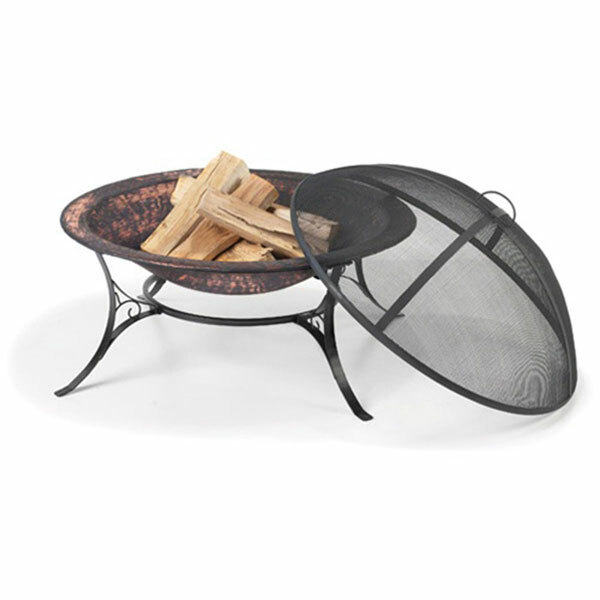 Conveniently sized for any backyard, beach or patio, Fire Pits are designed with an extra deep basin that cradles wood or coal and extends the warmth, comfort and glowing ambiance of outdoor entertaining. Based on an ancient Mayan design, the beautifully stamped, raised relief of the Fire Pits rim, adds even more atmosphere. Complete set comes with 20 gauge Spark Screen, Basin and Stand. We stand behind every product - Your satisfaction is guaranteed! What is this material? This product is made from Wrought Iron & Steel. Conveniently sized for any backyard, beach or patio, Fire Pits are designed with an extra-deep basin that cradles wood or coal and extends the warmth, comfort and glowing ambiance of outdoor entertaining beneath the moon and stars - into the dawn of a whole new day! (compatible with standard grills). The powder-coated steel intricately woven mesh spark screen offer an added layer of protection to any outdoor fire pit blaze!